REVOLT ATHENS by Elli Papakonstantinou/ ODC Ensemble from Elli Papakonstantinou/ODC on Vimeo. BE Festival starts tomorrow (Tuesday), so that makes it a year since I was on the judging panel. I don’t really agree with art prizes (perhaps because I’ve never won one) so it was a bit hypocritical to agree to be a judge on an art prize panel, but I’m emotionally beholden to BE and find it difficult to refuse them anything. In the end I had a great week. It was lovely to have an excuse to clear my diary see all the productions at BE – the first time I’ve done this. Being a judge meant complimentary food in the fabulous ‘on stage’ BE restaurant and the biggest treat was meeting the other judges and arguing and agreeing with them. Naturally there were shows other judges loved for being profound, moving or clever that left me cold or disinterested. There was a show I loved but others felt lacking in some way and no argument I could make would persuade them otherwise. There was the show I expected to not like that I loved and acted as cheerleader for. There were shows we felt too slick, others too knowing. Should you be planning on drawing up a list called “The most playful, iconoclastic and talented artists currently working in Birmingham” we can help you out with a name… Michael Wolters. How often do you hear about something that sounds stupid or ridiculous, you write it off as such and then, at some future date, perhaps not so far in the future, you find yourself proved utterly wrong. In my case the answer is ‘far too often’ and Open Space ‘conferences’ is a case in point. This year I have the honour of being one of the judges for BE Festival. Here are five reasons I’m a fan of the festival. 1: I love the ‘lucky dip’ nature of the shows you will see. Each evening four short shows are shared, a tasting menu of surprises; a full meal just of starters – which are always the most exciting element of a meal. If you don’t like the flavour of one piece it’s not long before the next one comes along and the chances are high that there will be something each evening that you will find inspiring. 2: I love the cosmopolitan nature of every evening, seeing what artists from other countries are thinking about and playing with. This is a rare privilege, not a lot of international work reaches us in Birmingham and it’s especially unusual to see more ‘grassroots’ work and not the more predictable ‘big names’. 3: I love the food but more importantly audiences and artists eating together at long tables halfway through each evening reminds me of happy moments touring to theatre festivals in continental Europe, where making art doesn’t feel like a job but feels like life. 4: I love the sense of community at the heart of BE Festival. It was started for the excitement of it all by a group of friends working hard and relying on huge amounts of goodwill. Artists come to share their work, they are hosted by local residents and fed by the festival, volunteers help out and with BE NEXT the next generation of young artists are gaining valuable experiences making theatre. 5: I take an avuncular pleasure in seeing the festival’s reputation grow, the number of submissions increase, the cultural connections multiply, its ambitions soar and outreach work spread. Attending year’s festival causes me to remember with pleasure the excitement and anxiety of first B.E. Festival @ A.E.Harris in 2010. Returning as a judge this year means I’ll definitely be at every performance. If you see me around please come and say ‘hello’ I’d love to hear your opinions all the show’s you’ve seen. Best of BE FESTIVAL UK 2017 from BE Festival on Vimeo. It’s good to see BE Festival are on the road. They are touring three pieces from the 2016 Festival including one of my favourite shows of that (or any) year Vacuum, which I raved about here. It is around the UK so chase it down. Closer to our home, we’re looking forward to a rare Birmingham appearance from our Sheffield friends Third Angel. They are bringing their show 600 People to mac. It’s time to get out and about. Last year we toured one of our most popular shows The Cardinals to North America. As the show hit Toronto I was bowled over by a talk given by Dr. Matt Sergi. Matt is an expert in Mediaeval English Drama and he was talking about our show in the context of the religious mystery plays staged on the streets of York about five hundred years ago. So illuminating was the talk that we asked him to convert the talk into an essay, which he did. When we got onto the usual awkward issue of payment and it descended into a familiar row, us trying to force money onto him and him refusing to take it. Once we’d patched things up it transpired that Matt’s theatre company PLS was planning to bring two of its shows to the UK, so we’ve invited them to come and perform @ A E Harris as our guests and we’re delighted that they’ve accepted. The Cardinals c2011 7pm, 8th July. Admission £5 on the door (cash only) or tickets online via our shop. Three Cardinals perform the history of the world, without words in their miniature puppet theatre mostly aided by their young female mulim stage manager. PLS specialise in giving audiences uproarious glimpse into the dynamic, scatological, often very funny world of English theatre as it was more than six hundred years ago. They translate original scripts into contemporary English and combine these with real medieval music, costume design and performance practices to show us hints of a culture that was, in some ways more liberated than our current one. In a subversion of the original show’s anti-feminist themes both shows are performed by six non-male actors. Both shows are family friendly, free of charge, relaxed performance. Mankind is very distractable and so Mercy and Mischief are striving for his attention, while a cheerful demon who creates human error is never far from the action. After this performance there will be a modest party to welcome PLS to Birmingham – everyone is welcome. The bombastic King Life believes he will live for ever despite the Queen’s urgent warnings that a rival King Death has recently landed in their realm. Since only the first half of the original manuscript has been found the play’s inevitable mortal conclusion will be improvised each evening drawing on audience input. Thanks to the generous support of Connaught Fund’s New Researcher Award and in line with Mediaeval practice no charge will be made for admission to either performance, but donations will be accepted. Please help us promote Mystery and Morality to others either by pointing them to this post or by printing off this A4 flier/poster and sticking it up somewhere. Hold onto your hats everyone, there’s so much to see and do. The Lunar Festival has come and gone darn it. Craig says it was great, so let’s not miss out on any of the other good stuff. Alexander Zeldin, ‘new’ Associate Director at The REP has a devised show Beyond Caring opening in the venue’s Paint Shop opening on Wednesday, it arrives with great notices from elsewhere. On Sunday BCMG’s Remembering The Future is the de facto farewell concert for Stephen and Jackie Newbould, it features four new works and has been in my diary for a good while now. The weekend after Warwick Arts Centre host Doing Nothing Is Not An Option, a climate change and the arts conference which features presentations, discussions (and probably arguments) alongside three provocative shows. 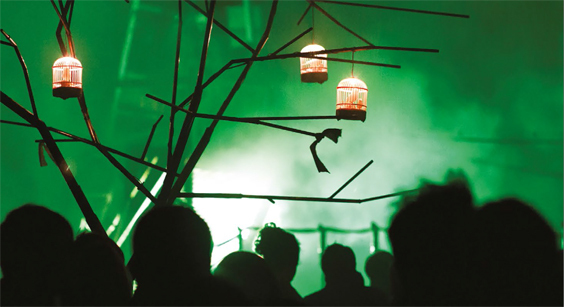 This year’s BE Festival is nearly upon us (21 – 24 June). LIFT is already upon London. Mark Anderson, one of our all time favourite collaborators, is around the country with his spectacular show Furious Folly, which we are desperate to see. The brilliant news is that the show is coming to Sutton Park, it’s free but you have to book, so please do book, but only book on 9 not 8 July as on 8 July we have a one-off performance of The Cardinals @ A E Harris as they limber up to go to Basel in September (this may seem a little premature but a section of the show is being presented as part of On The Edge festival of children’s theatre that runs 2 – 9 July in Birmingham. The Following weekend we have special guests @ A E Harris. PLS are with us all the way from Toronto, with two medieval morality plays. Mankind will be performed in our courtyard on 16 and The Pride of Life in our theatre space on 17. We will have a party after one of these performances but we’re not telling you which, so you’d better commit to coming to both (there is no charge, just donations). More on this later. Birmingham Fest kicks off on 15 July and @ A E Harris we are pleased to be hosting Gus Watcham (19 July), Lucky Dog who are returning to the venue on 24 July after last year’s triumph; Reactor Factory on 29 July and Blancmontage are in on 31 July. Are you Devoted to making and watching theatre type activities but often a bit Disgruntled that things could work better in this field? Well, if so then the ideal place for you to be between 9th and 11th January next year is The REP in Birmingham where the 11th Edition of the Devoted and Disgruntled Open Space event takes place.